This entry was posted in Racing on December 7, 2011 by Steve Tilford. I read an article a couple days ago about someone hacking into Alexander Vinokourov’s email account, but didn’t really think much about it other than he might get caught up in some drug scandal. Then Velonews.com had this article from a Swiss magazine about Vino buying the 2010 Liege-Bastogne-Liege from Alexander Kolobnev for 100,000 Euros or so. I don’t know what to think about the whole thing. Obviously, I don’t want to see classics being bought and sold. But, that being said, I’m not sure I want the media making something out of nothing when they find out that money exchanged hands after a race. I very much doubt that we’ll ever really know why Vino paid Kolobnev the money. I can think of quite a few scenarios where Vino might have agreed to pay Kolobnev that isn’t really unsporting. I’ve written about this before, but cycling is a very strange sport because of drafting and team tactics. The best guy doesn’t always win the race. And a rider conceding to not win before the race is officially over isn’t “fixing” the results. It is the weaker rider trying to maximize his results. It happens all the time. 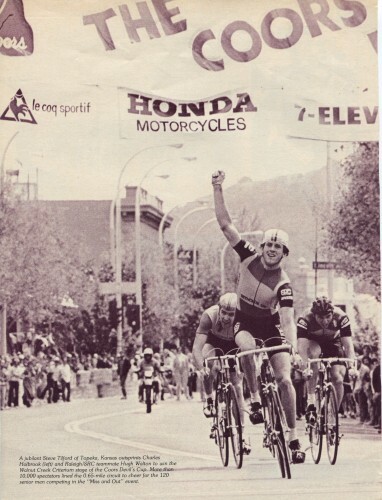 Below is an article from the 80’s about me having a similar problem in an important criterium, The Coors Devils Cup, outside of San Fransico, in Walnut Creek. The problem was that our team was trying to secure a Levis sponsorship, so having this article on the front page of the Chronicle’s Sports page was about as bad as it could have been, since Levis’ headquarters is in San Francisco. If you were reading the article, as a non cyclist, you might think that the race was fixed. But not even close. The guy that finished 2nd, Charlie Holbrook, conceded the race as soon as we were off the front. He couldn’t pull and I was about to shell him when he told me that he wouldn’t sprint. The race was strange, being a miss and out criterium. We were just about to lap the field, but the problem with that was we could still get pulled. The reward for lapping the field was one free “not get pulled” token. So, when we came up to the back of the field, we just sat behind them as the last 10 guys or so sprinted each time at the finish line and then sat up and rested. It probably looked extremely weird as a spectator. Anyway, after riding a couple laps at 20 mph behind the few riders left, Charlie tells me he is feeling much better and thought he would sprint. I explained to him how it worked when you make deal. I told him I would split the primes I had won while we were off the front, which was a lot, maybe $1500. He said that all he needed was $200 and said sure. In the meantime, Hugh Walton, my team mate, got away from the field and lapped us in about 3 laps. I told Hugh that we had a deal. Huge wasn’t big on it, but he agreed to get third. Now, I have a different view of this. When the combination changes, then all deals are off. Now I would have just told Hugh to take off and I would sprint with Charley. But, we didn’t do that. Anyway, Charlie secured his placing, but then went and did an interview the the Chronicle after the race that made the result look fraudulent. The paper didn’t bother to talk to me. I didn’t want to expend the energy to get rid of Charlie early on, so I agreed to pull him around. That was a gift to him, but it caused a lot of grief down the road. Anyway, I hope that this whole Vino scandal doesn’t blow into something crazy. Like I said above, I doubt that we’ll ever really know the true story, since I can just about guarantee you that neither Vino or Kolobnev are going to talk, so it’s not really that interesting in the long run. Cyclingnew.com just published this that seems to insinuate that Kolobnev didn’t race to win. I’m still thinking that they are not going to talk, but maybe the Swiss magazine has more emails. The whole thing seems pretty shady, from both sides, the cyclists and the journalists. Here’s the article. Click twice to enlarge. I obviously couldn't have outsprinted Hugh at the end. Here is a photo I stole off his facebook page of his and Gordon Singleton's legs. I’m guessing Singleton’s are the ones on the left. Hugh is spelled HUGH not HUGE. I think Huge is more appropriate. Cheat is Vino’s middle name. Nothing he is alleged to have done surprises me. If you don’t know, Benjo is probably the leading bike racing historian in the world. I think you screwed Walton and he was deservedly pissed. Your team was the strongest out there. If the guy you were off the front with was blown and you didn’t need him why didn’t you just drop him and solo back to the field? It’s crap like this that pisses a promoter and the little guys off. This and Vino’s are classic examples of cycling’s dirty underside. Throw in gambling on races (which is common in Europe) and you have a real slimy appearance to potential or existing sponsors. “The University of Maine suspended 19 members of its football and basketball teams for their roles in a $10,000-a-week gambling operation; the University of Rhode Island and Bryant College uncovered a gambling ring involving student athletes; a Northwestern University running back who became the school’s career rushing leader fumbled the football on the goal line to ensure that his team would not beat the point spread and that he would win his $400 wager; a Central Florida student team manager was convicted in federal court of offering $15,000 in bribes to players to hold down scoring and cover the point spread in a basketball game with Stanford; Boston College suspended 13 members of its football team for betting on college sports, including three who reportedly bet against their own team; two Arizona State players were convicted and sent to prison for shaving points; two former Northwestern University basketball players were convicted of rigging games against Penn State, Wisconsin and Michigan, a scam organized by a former Notre Dame place kicker turned bookie; four former Northwestern football players pleaded guilty to perjury charges after lying to grand juries investigating sports betting at the school; and last year the University of Michigan released a study saying that nearly half of the male athletes in the survey acknowledged wagering on college sports. The study indicated that 1 of every 20 players shaved points, bet on his own games or leaked insider information about players to gamblers. What’s the difference between “brokering” the outcome of a bicycle race and what was reported in the Time article? 100,000 seems like a lot of money, but maybe that was the market rate, considering the size of Vino’s ego. Fausto-I didn’t screw Hugh. It is very hard screw someone you’re not racing against. I was racing with Hugh. The problem was the rules of the race that made in very undesirable to lap the field. If I lapped the field, I could still get pulled and loose the race and end up 7th. It wasn’t the leader on distance. I knew Hugh was coming around to lap us. If it would have been Leonard Nitz or Eric Heiden or someone, then I probably would have went ahead and tried to lap the field, go right by them and hope they didn’t see me coming by, probably right after they just did a sprint at the line. But, that wasn’t a sure thing. The only sure thing was doing what we did. And I did all the work lapping the field when they were still racing. By the time Hugh had attacked them, there were only a few guys left that were sprinting and resting, thus the average speed was down to nearly nothing. Charlie and I were sitting 50 meters behind them riding slower than training speed. It was a weird scenario that I’ll probably never experience again. 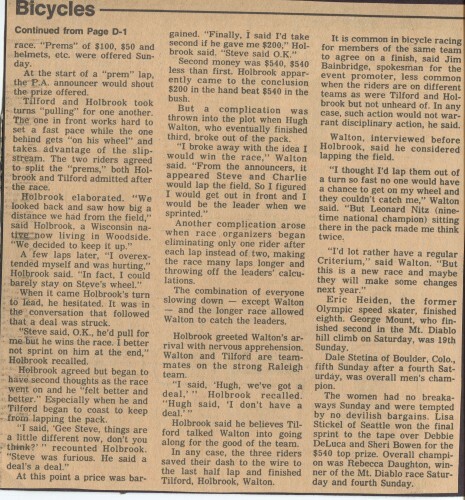 And Hugh got to be the winner in the sister race, The Coors Angle’s Cup, in Los Angeles, a couple weeks later. Spread the wealth. It seems to be the universal expectation that road races usually have brokered outcomes given the presence of riders of a certain skill and training level – that these riders will make deals amongst themselves to determine finish orders. This is nothing new, I’ve heard of this practice occurring for at least the last 30 years. Floyd Landis also said in his interview that all of the top finishers in the TdF for the last 25 years used doping or drugs to secure their placings and ensure their competitiveness over riders who did not use doping or drugs. At what point does cycling, especially road racing, cease to become meaningful as a competitive sport? In a flemish (Belgian) news paper they printed the translated E-mails. Kolobnev says “more then for the money I did it for you, if it was anyone else i would have gone for the win”. If this is true than he clearly sold the win. There is no talk about lets ride togheter to the finish and the winner pays number 2 the amount of 100.000€ , wich would be more pleasant to read. John- I saw that. But, you have to remember all these emails were after the fact, when the Kolobnev is still trying to get the money. There is probably some posturing going on. Usually when a deal is “brokered”, the guy that gets the money is the weaker rider. I have no idea how this arrangement was done. To me it seems like the money isn’t enough to sell L-B-L. Specially because Kolobnev hasn´t won annything (big) yet. I would think that the possibility of winning one of the monuments for the very first time would be unpayable. So I hope you`re wright and that the arrangement was that the winner pays. I find it odd how so many people love to hate Vino. Is he really anymore guilty than the others that have doped and got caught or those that do and don’t get caught. Others that dope get a second chance…I guess he gets put with the black sheep herd same as Landis..while Basso and Millar are OK? As this story headlines on numerous news pages I find it ironic that the fact that UCI did ZERO bloodwork at Tour of California, Tour of Utah and US Pro Challenge. Bri, I agree – people love to hate Vino. Fine, let them. Maybe part of why they hate him is that he just doesn’t give a crap what people say, except for a brief moment of weakness/normal human sentiment after Liege when the press’s carping got the better of his normal spirit. Vino has been a true animator of cycling – doped or not – and the sport needs characters like him who add uniqueness and human drama to the sport. Otherwise it would be boring. It’s not Church, for Christssake! Guys-Here’s Micheal Creed’s blog entry from Cyclingnews.com on the Vino deal. I can’t say I really disagree with much of what he wrote here. It is just one guys opinion, but it makes sense as much as anything else. I agree wholeheartedly with the Mike Creed opinion blog, and I’m surprised CN printed it. In addition to telling it like it is, he paints their forum in a pretty dim light, rightfully so. I’ve given up trying to voice the pro-Vino position there (or at least the position that says this is much ado about nothing) as it’s a circular argument with most of the commentators, but it’s worth a look to see what Creed is talking about. Broken-It isn’t “fixing a race” when a team works for a rider and he wins. Or if a team mate lets another team mate win. That is being generous. That Devils Cup race format was pretty screwy to start with. An invite for race tactics like that. And to change the rules part way through the race? Shows a lot of incompentence by the organizer and head official. Deal-cutting, mixed with gambling = “sporting fraud”. Not saying what you did rises to that level, but in Europe, it does and smells just like point-shaving and throwing games in other sports. It’s an archaic, old-school mentality that has no business in a sport that is trying to get past drug scandals and become a major attraction again. I think Vino was bought off by Ulrich at the Olympic road race. That shouldn’t have happned when Kloden was also in that break. It f’ed Kloden and Vino did what he was told as he would’ve smoked (no pun intended) both Germans in a straight up sprint. Vino isn’t a villain, because he paid his dues, but it still makes cycling look scummy. Fausto, UCI-governed cycling IS scummy, no doubt about it. Puritanical American sports fans aside. I’m here to defend both the practice of deal-making out on the road, and Vino, and I remain to contend that if it was any rider other than Alexander Vinokourov accused of doing this no one here would be whining and carping about it like you are. Some who’ve commented here and on other sites seem to believe in some idealized, fantasy cycling that bears no resemblance to the reality of the sport – and I’m not talking about doping. The point also remains that Kolobnev may very well not have been strong enough to beat Vino and simply bluffed him into such an agreement. If you watch the final moments of the race and count the number of times Kolobnev stands up but then is forced to sit down while trying to respond to Vino’s attack, and the number of pedal revolutions during each interval of standing, the Russian’s form appears consistent with a rider suffering cramp or on the verge of suffering cramp due to muscular fatigue (vs. electrolyte imbalance/dehydration). Although only a detailed analysis of his power output during the entire race and comparisons to previous data and historical trends could confirm it, I doubt that Kolobnev could’ve actually beaten Vino – but I applaud the Kazakh for his thoroughness in covering all angles to seal the win. It would’ve been both a pleasure and an honor to compete against him, break away with him, and receive the offer of a loan from him – especially if I suspected he’d beat me anyway. Nevertheless, what many seem to be willfully ignoring is the exact wording of the collusion rule, which allows more than enough room for both Vino and Kolobnev to argue that they delivered a watchable, compelling “show” to the public and maintained the honor of the race – if they felt compelled to respond affirmatively to these allegations at all. The only villain here is the Swiss magazine which published these sensationalized allegations, since for over 1.5 years none of you to my knowledge has felt that dissatisfied with the outcome of L-B-L w/ respect to the sporting-appearance of the finale. I understand that many of you may have thrown-up in your mouths because Vino won, but I don’t think you puked because of how he won. If you are a pro bike racer you are in it to make money. Kolobnev is clearly a great poker player. He clearly had a contract stipulating money for a win so he made sure he got money win or lose. That is a rather smart pro bike racer. So what if he won L-B-L or not. It’s only us amateurs who think we race a clean race. Oh but then again plenty of money has changed hands in amateur races. Was it not LA who said bike racing is like poker. A coup de poker! It’s interesting to consider Kolobnev’s rather blasé attitude towards the idea of adding a Monument to his palmarés, which lacks a win of that magnitude. While not proof, it seems like more evidence of his not having been confident of beating Vino in the first place…maybe the Russian has a career as a poker player in his future, if CAS rules in the UCI’s favor in their appeal against his return.